Ok I'm not supposed to post until tomorrow morning but I can't resist. My Submission this week for the Halloween home decor challenge is three 2x2 wooden cubes. I decorated them with halloween papers glued on with Scrap Happy Glue and mod podged them to seal them. One side was decorated with cream colored Pugnacious paper and stamped with the You need to dust stamp. I created the little spider by using two different sized black pearls (you could use jems too) and drew on the legs with a marker. Isn't my spider just the cutest!! Thanks for stopping by, don't forget to share your halloween home decor "Tricks" for your chance to win a "Treat" of your own. This week's challenge at The Rubber Cafe is to make a home decor item...and I was inspired by the Leaf Swirls image and Tesa's challenge card this week. I found this kraft box that has been in my stash for a bit. I did some black embossing on kraft cardstock and then fussy cut the leaves and glued them to some black glossy linen cardstock. I wrapped some coordinating ribbon around the box, as well as some twine which I threaded through a vintage button. 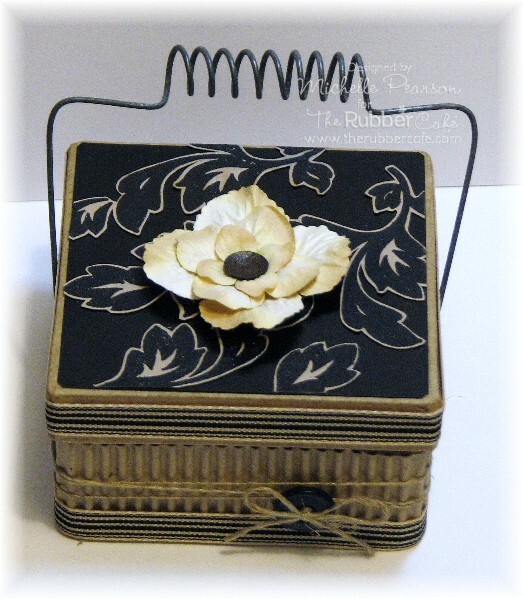 I finished the top of my box off with some Prima flowers and a brown Candi center. We hope you can join in the challenge....Melissa always gives a nice prize for a random participant! Maybe this is your week to win! Happy Friday to you, I hope you have your Halloween costumes all picked out if you celebrate Halloween. My little one is going to be a Pirate Princess and even her daddy is dressing up, he is a Pirate, this should make some really good scrapbook pages..he he. This weeks challenge was to take some kind of home decor item and turn it into a Halloween creation. So I took an old photo frame I had and started creating. You can see the photo frame is pretty basic, nothing really to it at all. I started out by laying the frame on white card stock and traced where the photo cut outs would be and trimmed them out. Let the stamping begin.............I used H-917 You Need To Dust, D-488 You Shake My Bones and CL-002 Trick or Treat. I stamped the images randomly around my white card stock, then using my Copic Markers, I air brushed a grey tint around the frame, to make it look spooky. I used a few Spellbinders™ die templates S4-279 Graveyard Scene and Shapes, S4-280 Halloween Fence Scene and Shapes and S4-277 Nested Bats. I added some orange festive fringe around the frame and adhered my die cut outs to the frame. I mixed some Scrap Happy Glue and some You're So Fine Terrifically Teal Glitter then carefully brushed it on the die cut pieces, it really looked cool like they kind of glowed in the dark, well that's the look I was going for. Thanks for stopping by my post today. Show us Your Halloween Décor! This week The Rubber Café design team is showing off their mad home décor skills! Hopefully you’ll be inspired to make your own decorations too. I’ve been wanting to make a wreath for a long time so I decided our front entry needed a little bit more pizzazz so here is what I came up with. A little Trick-or-Treat fun to get us in the mood to hand out some candy! Here’s how I made this tissue paper wreath. 1. Stamp the I-986 Roaring 20’s Placard with Distress Ink Old Paper on to two sheets of white tissue paper. Then over-stamp using the small bat from the CL-002 Pumpkin Face Mix-n-Match set using Memento Tuxedo Black and cut into 3 x 3 inch squares. 2. Cut two concentric circles from your chipboard. The largest circle should be approximately 10 inches in diameter. 3. Crumple the tissue paper before pushing the center in to form a pocket. Place some hot glue on the bottom and adhere to the wreath form. 4. Next curl some black wire, thread some beautiful beads onto it and adhere to wreath. Don’t the little bats look adorable peaking out of the paper? 5. Finally stamp the Trick or Treat from the CL-002 Trick or Treat set using Memento Tuxedo Black and back with black cardstock. Embellish with 121007 Crystal Jellie Dots and adhere to project using TRC0010 Scrap Happy Glue. I hope you’ve enjoyed my tutorial today. I really a lot of fun making this wreath and it didn’t take me long at all. So here is your challenge and a chance for a gift certificate worth $20 to The Rubber Café! We would also like to congratulate the winner of last week’s challenge! You are the winner. 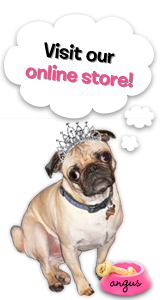 Please contact us at marketing@therubbercafe.com so that we can send you a $20 gift certificate to the store! Congrats and have a great holiday everybody! Do you ever finish a card and just squeal in delight at the results??? That's how I felt about this card when I finished it! I am absolutely in love with it and I think you will be too! I started with a Center Step Card design out of rust colored cardstock. I stamped Falling Leaves on three 7/8" strips of Pugnacious Signature cream paper and colored them with copic markers. The main image is Fall Harvest, which as you probably know by now is one of my very favorite images at The Rubber Cafe! The bling around the main image is surrounded with Nestabling Labels Two Orange Rhinestones by Want 2 Scrap. The Rubber Cafe has tons of different Nestabling's that fit many different Spellbinders dies. They are really easy to apply as I hope this picture shows. Here is a side view of the card so you can see more of the detail. For the inside I used the largest Label 2, stamped it with Give Thanks and added more Nestabling Labels Two Orange Rhinestones by Want 2 Scrap. I hope you enjoyed my project today and loved it as much as I do! Let me know...I'd love to hear from you! 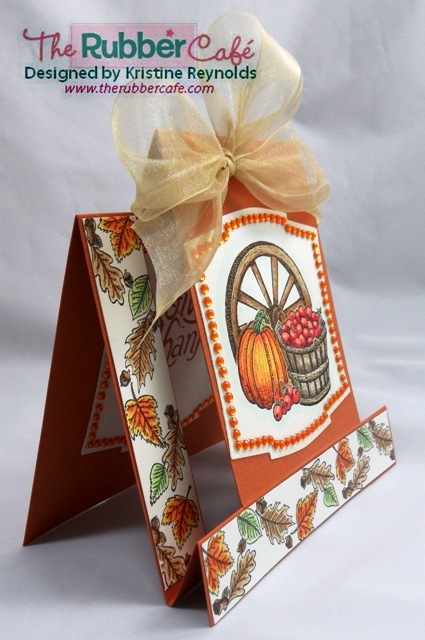 We have tried to inspire you to create for Fall with Spellbinders this week and are looking forward to seeing what you come up with! Here is my card. Lot’s of Kraft and black but the flower ads some pink. The colors come out pretty strange but here is a better one from another angle. I worked with some dimension. 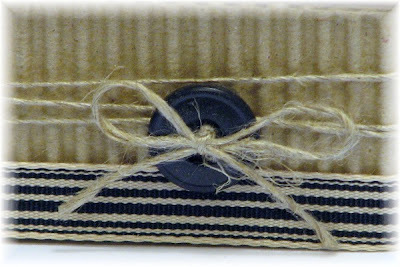 The tag is stamped with the beautiful Yellow Foxtail stamp. LOVE this one! And it’s buddy Green Foxtail which I used for the inside. The leafs are from the Leaf Set 2 and I fuzzy cut them and popped them on 3D foam. The sentiment is from the Fabulous Phrases set. You have until Wednesday to make your Fall card and link it up to THIS post to be eligible for the prize of a $20 gift certificate in the web shop. All info about the challenge can be found HERE. I'm loving this week's Rubber Cafe challenge...and went with a more natural elegance for my fall card. No bling, just some gorgeous designer papers to set off one of my favorite Rubber Cafe images...the Yellow Foxtail. I used two sets of Nestibilities Labels Four Dies; the Small as well as the smallest of the Grand Labels Four set. These are a dream to run through the Spellbinders Grand Calibur, you can do several dies with one pass! Papers are Prima's Madeline collection. 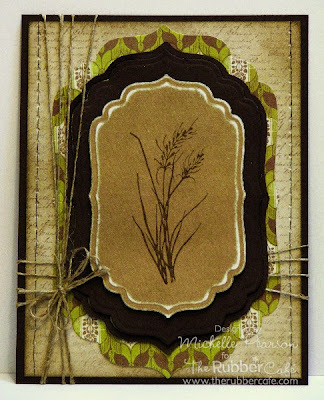 I distressed the script paper with Tim Holtz's Frayed Burlap Distress Ink and the Lil Inkerz. I used twine and a touch of sanding and faux stitching to embellish my card. 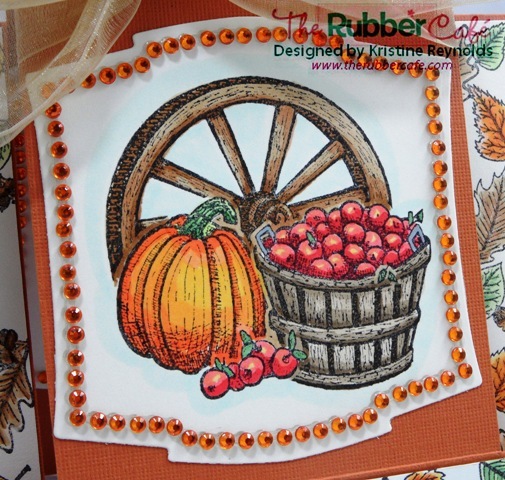 Be sure to pop by The Rubber Cafe Blog this week to see the design team's elegant fall projects and check out the challenge details and prizes...you won't want to miss it! I had a lot of fun creating this card for this week’s challenge. Did you know you could win a $20 GC to The Rubber Café? It’s really easy. Simply visit this post to find out all the details. When you sit down to make a card there is nothing like being able to diecut your pieces quickly so you can start playing with glue! 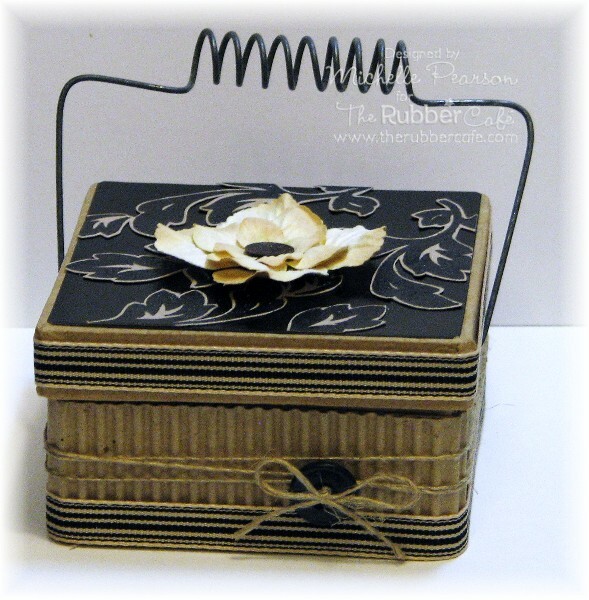 Well Spellbinders™ makes it so very easy with their Grand Calibur™ machine. 1. Cut card base to 5 1/2 x 11” and card facing at 5 1/4 x 5 1/4. Fold card base in half lengthwise. 2. Pierce card facing with a stick pin at even intervals along each side and adhere to card base using TRC0010 Scrap Happy Glue. 3. Diecut S4-190 Labels Four #5 and S5-031 Fancy Labels Three #1 and ink the edges of the label with Tim Holtz Old Paper Distress Ink and our Lil Inkers tool. 4. Stamp Thinking of You sentiment from J-1095 Fabulous Phrases set in Tim Holtz Vintage Photo Distress Ink. Snip right side of Fancy Tag off before adhering Want2Scrap Baby Bling Pearls to label and 121007 Jellie Dots Silver with Stick “Em” Up tool to center of lace flower. 5. 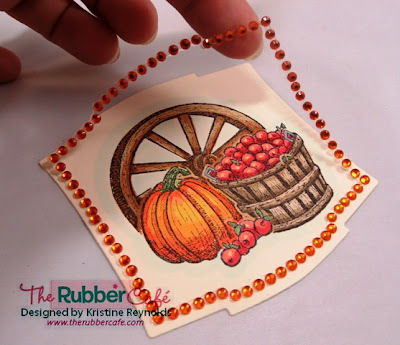 Assemble card using embellishments of your choice. I hope you’ve enjoyed my tutorial and project today. Can’t wait to see what you come up with for this week’s challenge!